Each day, thousands of patients receive medical treatment in doctors' offices, clinics and hospitals, assisted living facilities and nursing homes. They trust that the care they are receiving is appropriate, and that healthcare providers are properly trained to provide effective care. Sadly, this is not always the case. There is always a risk of medical malpractice in hospitals, clinics, and other healthcare facilities. This can permeate all aspects of your treatment. All medical personnel including doctors, nurses, laboratory technicians and pharmacists all make mistakes. When they do, they should be held accountable for the harm they cause. If you or your loved one are harmed in the course of receiving medical care and your lawyer can prove that your doctor deviated from the standard of care, you may be able to file a claim for damages. This requires extensive work and resources from an experienced attorney. 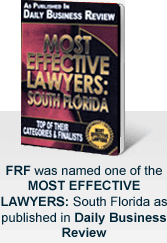 At the Miami law firm of Friedman, Rodman & Frank, our personal injury and wrongful death lawyers, along with a strong support staff, have the legal expertise and investigative know-how to build substantive medical malpractice cases. We have been helping injured clients, for more than three decades, and we want to help you too. In a recent medical malpractice case, we secured $125,000 a year for the rest of our client's lifetime because of the serious harm caused by a hospital's negligence. The settlement is valued at 10 million dollars. Please visit our Verdicts section to see some past results from the firm. If you believe medical error or negligence has harmed you or resulted in the death of someone you love, call our office today at 305-448-8585 or toll free at 877-448-8585 or contact us online to arrange a free and confidential consultation. Whether you speak English, Spanish or Creole, you will be able to communicate with all of our attorneys and staff.